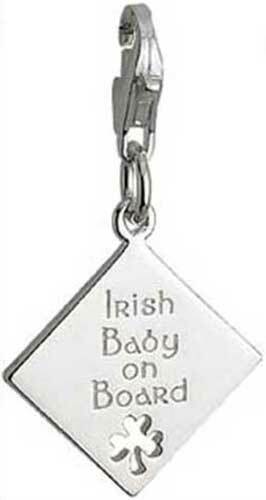 Sterling silver shamrock charm features Irish Baby on Board. This sterling silver shamrock charm features the shape of sign with the engraved words Irish Baby on Board. The shamrock clip on charm is complete with a lobster claw catch and measures 1/2” wide x 1" tall, including the jump ring and the catch.